Dimensions 1 by 9.25 by 10.25 in. Amazon.com description: Product Description: Co-founder of the legendary Brother Juniperâs Bakery, author of the landmark books Brother Juniperâs Bread Book and Crust & Crumb, and distinguished instructor at the worldâs largest culinary academy, Peter Reinhart has been a leader in Americaâs artisanal bread movement for over fifteen years. Never one to be content with yesterdayâs baking triumph, however, Peter continues to refine his recipes and techniques in his never-ending quest for extraordinary bread. 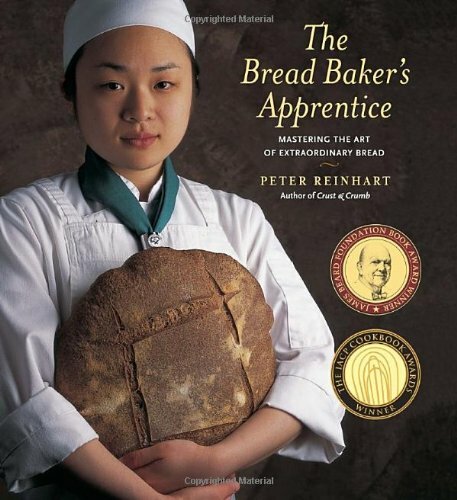 In The Bread Bakerâs Apprentice, Peter shares his latest bread breakthroughs, arising from his study in several of Franceâs famed boulangeries and the always-enlightening time spent in the culinary academy kitchen with his students. Peer over Peterâs shoulder as he learns from Parisâs most esteemed bakers, like Lionel PoilÃ¢ne and Phillippe Gosselin, whose pain Ã lâancienne has revolutionized the art of baguette making. Then stand alongside his students in the kitchen as Peter teaches the classic twelve stages of building bread, his clear instructions accompanied by over 100 step-by-step photographs. the loaves youâll turn out. This is original food writing at its most captivating, teaching at its most inspired and inspiringâand the rewards are some of the best breads under the sun. About: Co-founder of the legendary Brother Juniper’s Bakery, author of the landmark books Brother Juniper’s Bread Book and Crust & Crumb, and distinguished instructor at the world’s largest culinary academy, Peter Reinhart has been a leader in America’s artisanal bread movement for over fifteen years.